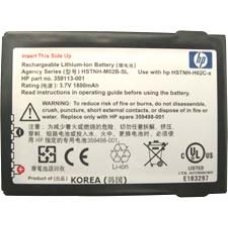 Official HP replacement lithium-ion battery for the iPAQ hx4700 series iPAQ PDA. Always carry a spare battery and save running the risk of having no power on hand at that crucial moment. This is an original battery part as specified by HP. Exact official replacement for the following battery part numbers HSTNH-M02B-SL, HSTNH-H02C-x, 359113-001, 359498-001. * 3.7v 1800 mAh Capacity.